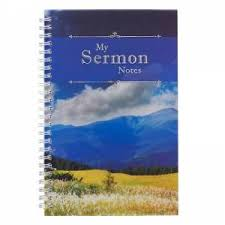 52 week notebook with space for date, place, speaker, theme, key Scripture verses and sermon notes and how to apply the message to one's own life. Includes a one year Bible reading schedule. Spiral, durable PVC cover journal with NIV Scripture verses on each page.